Know what you’re looking for? Use the search bar. Just looking? Browse through our categories below. 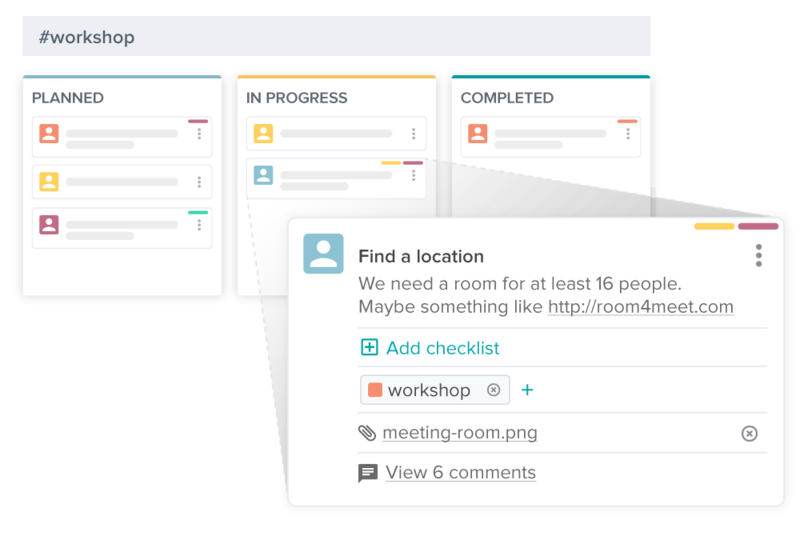 Workstreams is the very best way to manage all your projects, tasks and people, regardless of whether you are a 1-person company or part of a 1000-person company! It is a completely new approach to project management, with zero overhead, that not only gives you an overview of all your tasks, but also, it helps you manage all the communication that goes with your tasks. How is this possible? Because there are two parts to Workstreams. First, the Workstreams Slack app which leverages the hottest chat tool available today to provide task management and communication among your team. 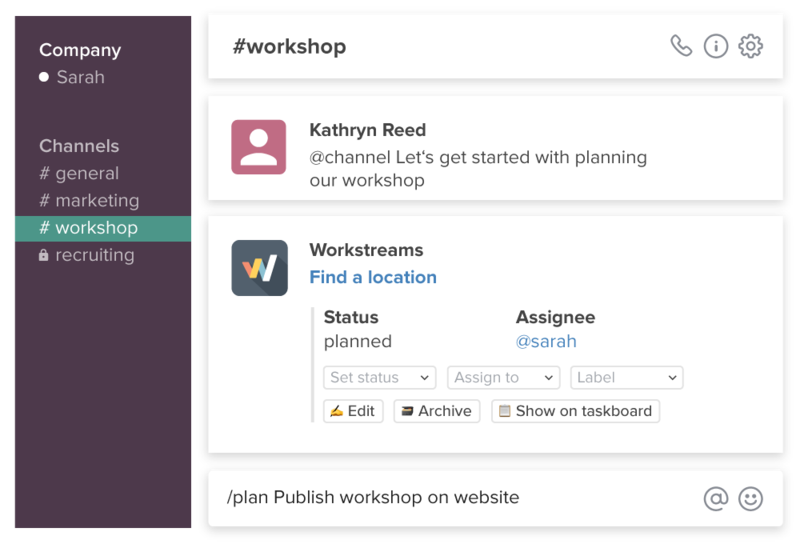 Second, the Workstreams web app which mirrors everything you do in Slack on a beautiful Kanban board. Together they provide a perfect synergy for all your projects! What is the Workstreams Slack app? Slack has revolutionized internal company communication in just a few short years with its powerful features that go way beyond just chat. The Workstreams Slack app leverages the power of Slack but enhances it with comprehensive project, task management and resource management. Slack uses channels to organize communication. Workstreams uses channels to organize projects. So all you have to do is set up a new channel for each project and start assigning tasks. All your resources are already set up in Slack so just assign them to tasks. All your communication already happens in Slack so there’s no new tool to use. All you have to do is learn a few new slack commands and you’re up and running in minutes, and we provide a friendly Workstreams Bot to guide you along every step of the way with training tutorials and help information. You will be be creating projects and tasks in minutes. Try doing that with other task tools! 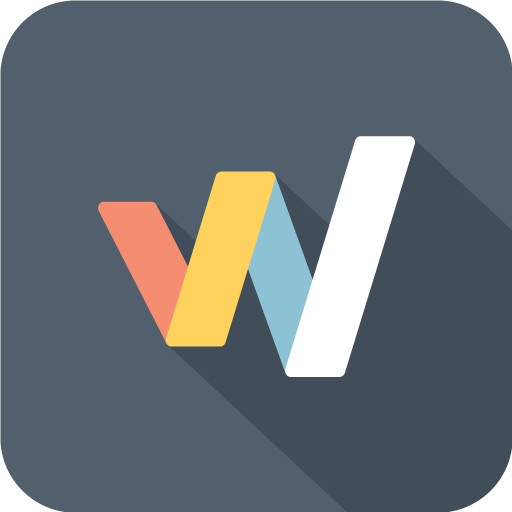 What is the Workstreams web app? The Workstreams web app is the Yang to the Slack app’s Yin. Together, they provide a perfect harmony for all your task management needs. The Workstreams web app is centered around a beautifully elegant Kanban board that shows all your tasks, organized by project. And it’s always in sync with Slack because every change in Slack is immediately reflected in the web app, and vice versa. All the things you can do in the Slack app you can also do in the web app, but the web app gives you even more features, such as Goals, Progress Flow Charts, Burndown Charts and much more. Where it gets even more amazing in the web app is the ability to easily customize your Kanban board. Every team tends to have its own unique process and you can add as many steps as you like to the Kanban board to reflect this. Sign in to your Slack account in the usual way. A new app then appears in Slack named workstreams, inside of which you see the Workstreams Bot. He’s the friendly guy with the big smile and glasses. He’ll walk you through everything you need to do, starting with a quick tutorial on how to use Workstreams. So you can be a Workstreams pro in 5 minutes or less. Maybe 4 if you’re a fast typist! Once the Slack app is installed to your workspace, just go to the channel where you want to set up a project and type /invite @workstreams in that channel. You receive a notification in Slack each time a change is made to one of your tasks. The notification indicates the Status, the Assignee and it provides buttons so you can take action. Just click on the Edit button to modify the details of the task. Or click the Assign to drop-down to see all the team members in a channel and then assign the task to one of them. Want to look at the Kanban board instead and edit tasks in the web app? No problem! Tasks always appear as a blue hyperlink so just click on it to jump to the task in the Workstreams web app. In addition, the entire history of changes is stored in a Thread so you can see every single thing that happens to a task. Go to the channel where you want to add a task. Press Enter and the Recruit Programmers task is created. Press Enter and the Interview Programmers task is created. To see the two tasks that you just created, and any other tasks on the channel, type /tasks. Select Recruit Programmers from the drop-down to see all details for this task. For users that are comfortable using their keyboards to navigate the web, we have developed a set of shortcuts to ease you into the Workstreams.ai web app. They are a great way to make your usage faster and more convenient. If you are a Slack power user, we believe you'll find our keyboard shortcuts familiar. You can always access a cheat-sheet containing all the keyboard shortcuts in the lower-left section of the Workstreams web app. The Workstreams Bot is not only friendly but informative too. Each time you invite him to a channel, he asks if you would like to take the tutorial. And each time a new team member starts using Workstreams, they are asked if they would like to take the tutorial. So take the money you allotted for ‘team training’ and put it into a ‘team party’ instead. We have you covered. Also, you can type /workstreams at any point in time if you want to take the tutorial again or see a list of commands and reactions that Workstreams responds to.